A blue shaded face with round eyes, wide downturned gapping mouth and eyebrows. This is the standard frowning face for emoji with eyebrows and blue coloring. 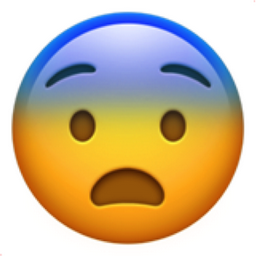 This emoji is in shock, full of fear, pale, and potentially shaking with fear. iEmoji old name: Feeling blue, surprised. Being startled by an event and still crying. Pale in fear.